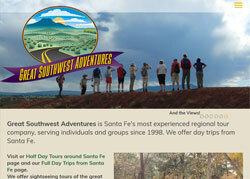 Welcome to studio x, inc. website design - Located in Santa Fe, New Mexico. We specialize in highly successful + affordable websites that our clients have the ability to update and maintain. We enjoy creating custom web design that we apply to content management systems such as Wordpress, Expression Engine, GLinks and others. Let us surprise you with all that our experienced team can offer at a very reasonable, competitive price! Getting started with your business and need a logo or a full branding package? To complement the marketing of your new website, studio x offers branding, print, newsletters, ongoing campaign strategies...and more. studio x, inc. - serving Santa Fe to the world since 1994.